Änderungen: Complete new GUI interface, Multi Language Support, Booking Engine Interface, GDS Interface, OTA Interface, CRS Interface, Revenue Management, Forecasting, Lot of new reports, Accounting system and many more. Mindestanforderungen: Intel i3 or higher processor, 4 GB RAM or higher, Windows Operating System. 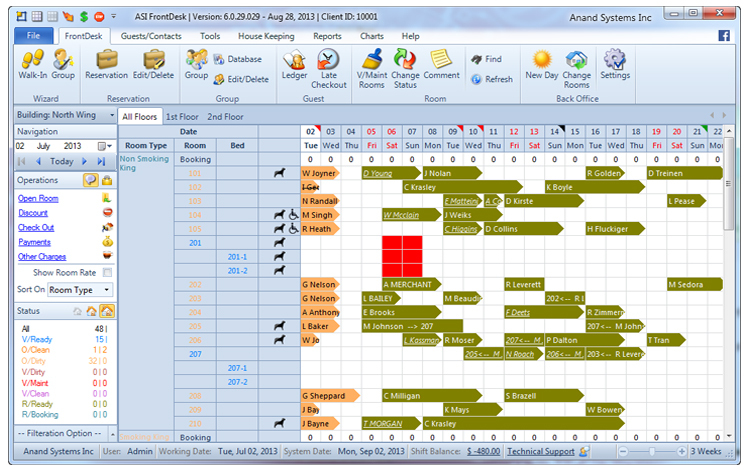 The trial version of ASI FrontDesk Hotel Motel Software V 6.0 can be freely distributed over the Internet in an unchaged form. 1. Agreement. This Software License Agreement ("Agreement") is a legal agreement between you (the undersigned end user licensee) and Anand Systems Inc., a Delaware Corporation ("Anand Systems"). By clicking on the I accept the agreement, by using Anand Systems, as applicable, you agree to be bound by the terms and conditions of this Agreement.